A Houston family by the name of Friedman decided to add an outdoor summer kitchen and screened-in dining room to the rear of their Craftsman style, two-story house. At a certain point in time during the construction of this new room, they decided that it was time to develop an entirely new master plan that and Houston landscape concept. 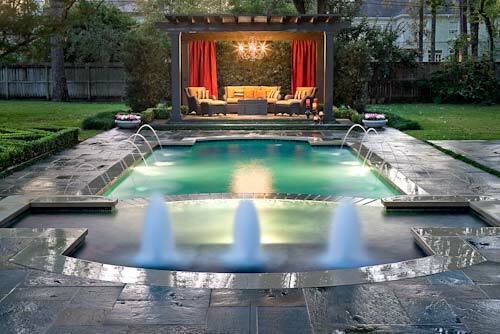 This new design would have a new custom swimming pool and patio that would connect to the new addition to an arbor at the other end of the pool—effectively extending the semi-outdoor space of the outdoor kitchen into the wide, open space of the pool, patio, and backyard. Our main objective in this project was to take an otherwise enormous tract of Houston landscape and turn it into a more inviting and intimate setting that would appear interesting and mesmerizing as opposed to vast and overwhelming. In order to do this, two things were necessary. We had to create some very unique structures, and we had to construct them in such a way as to create a very controlled sense of drama. One of the two most prominent elements on this vast expanse of Houston landscape was the ornate custom swimming pool that we constructed for the Friedman’s. It consisted of a two-level structure, with a fountain on one end. In the fountain there were three bubblers that shot water up into the air. The second part of the pool was lowered, and made accessible by four steps that were added to either side of the fountain. 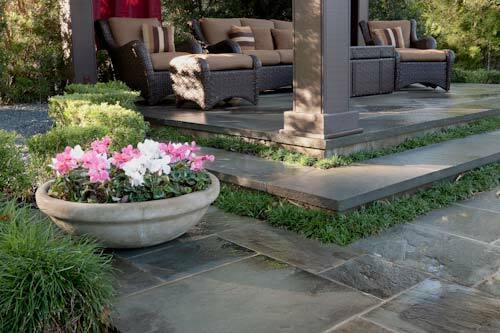 The size of these steps encourages a very gradual descent to the lower portion of the patio. 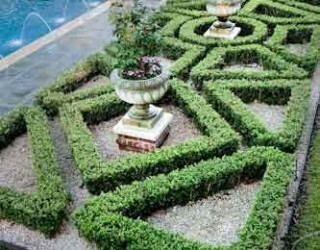 This generates a great sense of transition, and gives the eye plenty of opportunity to take in the arbor, parterre garden, and custom patio design. The bottom of the fountain was completely covered in blue glass tile and lighted from within. Although small in comparison to the rest of the pool, the uniqueness of the fountain’s design made it one of the most prominent areas of interests, ideal for pulling chairs around its perimeter. This fountain adds something of a spa element to the whole setting because it resides on the same upper plane as the spa. Its upper end is only 6 inches deep, but its lower end measures 18 inches in depth, which makes it an ideal mini-spa because it is both lighted and heated. People often recline here much like they do in the spa, dangling their feet over the edge of the waterfall that pours into the lower level of the pool. 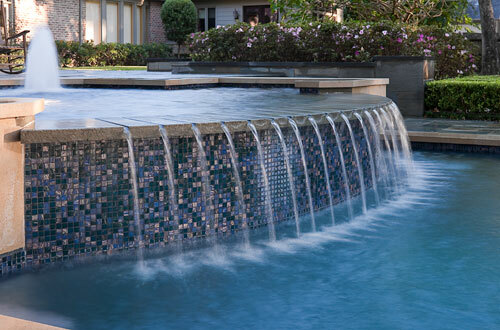 This waterfall was one of the most unique features we built for the Friedman’s. We had a quarry cut a slab of stone in a radius design and cut runnels in it with a diamond saw. After we thermal-finished the slab, we covered the front end with a custom blend of glass tile. The various colors and hues in the glass are intentionally reflective of the surrounding Houston landscape. 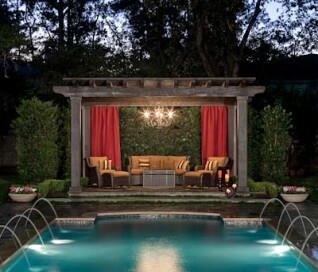 There is also a deliberate copper hue to the design to further magnify the reflection of pool lights. 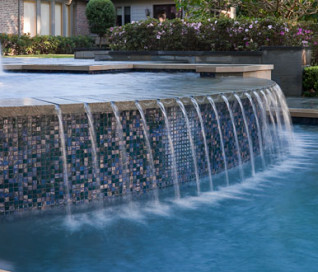 This waterfall does so much to establish the sophisticated, controlled sense of drama that we needed to connote intimacy and interest on such a large area of Houston landscape. The variation of tile coloration, especially when catching either sunlight or pool lights, especially mirrors the elegance of the adjacent parterre garden and the many flowers that adorn the side of the arbor entrance. 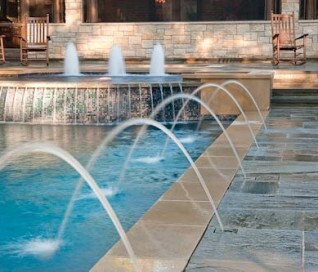 The custom coping and patio surrounding the fountain and the lower portion of the same are made from the same materials. 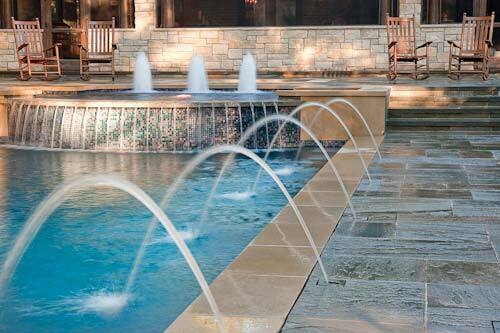 The coping of the pool is a lighter colored material known as Leuders Limestone. It has a rich hue that provides a superb compliment to both the architecture of the home. 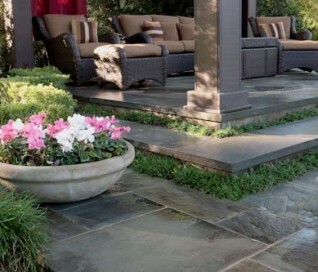 The patio itself is made of Pennsylvania full color sandstone. 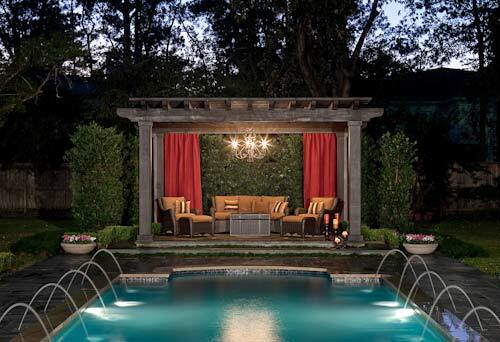 This patio was built with concealed water jets so water can rise up mysteriously from its surface and provide special effects when illuminated at night. When we completed this project, we had laid over 2,500 square feet of paving. Nevertheless, we were ultimately successful in establishing special area of interest and a feeling of drama through design. The key to this lay in the many grade changes we made. 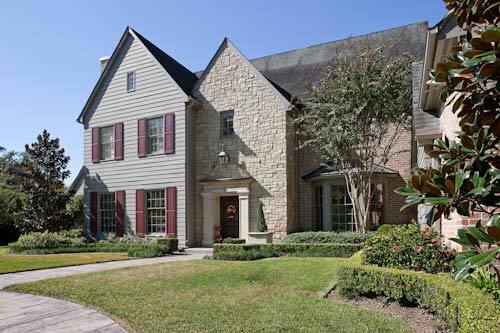 By varying things like patio elevation and step width, we could make even the largest of hardscapes on the Houston landscape feel intimate and inviting. 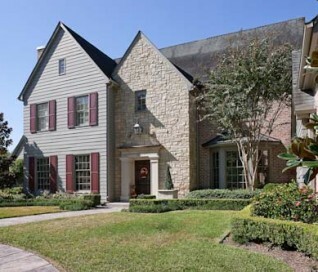 For more the 20 years Exterior Worlds has specialized in servicing many of Houston’s fine neighborhoods.